Transcriptional repressor Bach1 plays an important role in antioxidant response. Bach1 function is regulated by heme binding to the four cysteine-proline (CP) motifs in Bach1, which leads to inhibition of its activity. Three of these CP motifs are located N-terminal to the bZip (basic leucine zipper) domain that is responsible for DNA binding. Based on sequence analysis, the region surrounding these CP motifs was expected to be intrinsically disordered. Bach1 is one of few known intrinsically disordered proteins that accept multiple heme molecules for functional regulation, but the molecular mechanisms of heme binding and functional regulation remain unclear. Uncovering these mechanisms is important for understanding Bach1-mediated antioxidant response. 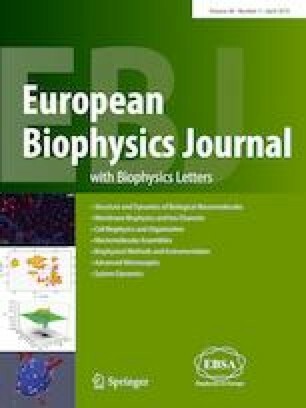 Biophysical characterization revealed that 5-coordinated heme binding was unique to the CP motifs within the heme-binding region of Bach1, whereas 6-coordinated binding occurred nonspecifically. Comparison of the wild-type protein and a CP motif mutant indicated that the level of 6-coordinated heme binding was reduced in the absence of 5-coordinated heme binding. Analytical ultracentrifugation showed that the CP motif mutant protein had a more elongated conformation than the wild-type protein, suggesting that cysteines within the CP motifs contribute to intramolecular interactions in Bach1. Thus, heme binding at the CP motifs induces a global conformational change in the Bach1 heme-binding region, and this conformational change, in turn, regulates the biological activity of Bach1. The online version of this article ( https://doi.org/10.1007/s00249-019-01364-5) contains supplementary material, which is available to authorized users. We acknowledge the support of the Biomedical Research Core of the Tohoku University Graduate School of Medicine. This work was supported by a JSPS Grant-in-Aid for Scientific Research Number 18H04021 and 15H02506 (KI) and Research Fellowships for Young Scientists (Grant No. 16J40189) to M. W.-M. We thank Natasha Beeton-Kempen, Ph.D., from Edanz Group (www.edanzediting.com/ac) for editing a draft of this manuscript. KI and KM received partial financial support from Teijin Pharma Co., Ltd. through a collaborative research contract.